This photo of Saturn's moon Enceladus, taken by NASA's Cassini probe on Nov. 27, 2016, shows the difference between the heavily cratered north and smoother south. A spectacular new photo shows the dual nature of Enceladus, Saturn's icy, geyser-spewing moon. In the image, which was captured by NASA's Saturn-orbiting Cassini spacecraft, Enceladus' northern reaches are heavily cratered, whereas the south is much smoother. Cassini took the photo on Nov. 27, 2016, when the probe was about 41,000 miles (66,000 kilometers) from Enceladus. Each pixel in the image measures 1,310 feet (398 meters) across, NASA officials said. North is up, and rotated 4 degrees to the right, they added. 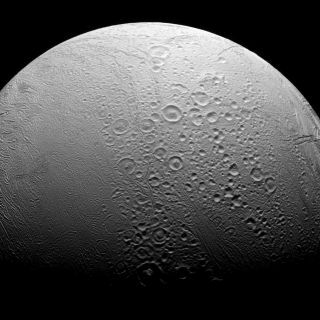 Enceladus' geysers further add to the moon's appeal as a target in the alien-life hunt. The geysers blast material from the underground ocean far into space, meaning a robotic probe could sample this potentially habitable environment without even having to touch down. The $3.2 billion Cassini-Huygens mission, a joint effort involving NASA, the European Space Agency and the Italian Space Agency, launched in October 1997 and arrived at Saturn in July 2004. The Cassini mothership delivered a lander called Huygens to the surface of Saturn's largest moon, Titan, in January 2005, then kept studying the ringed planet and its many moons. Cassini's long mission in nearly over, however. Next month, Cassini will enter its "Grand Finale" phase, completing the first of 22 orbits that will take the probe between Saturn's atmosphere and its innermost ring. Finally, on Sept. 15, Cassini will perform an intentional death dive into Saturn's cloud tops, to ensure that the spacecraft doesn't contaminate the potentially habitable Enceladus or Titan with microbes from Earth.